This was the worst Yes performance I ever saw, out of 12 shows I attended. 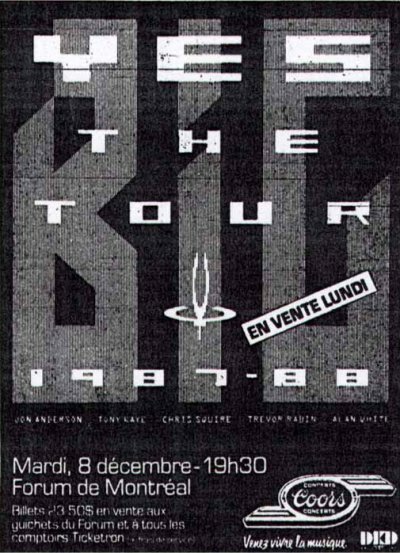 I was never a fan of the Big Generator album (subpar songwriting, bad production from Rabin). I managed to get tickets in the 4th row of the orchestra. The Forum was half-full, at best, a big letdown because their previous performance in Montreal (in 1984) had been a sellout. The show itself was lackluster. Anderson looked bored and was out of it, with rambling, new-agey introductions to the songs (and he wore some silly makeup). Rabin and Squire looked like they were enjoying themselves, however. Clearly, there was a deep division within the band about its musical direction at that time. I was particularly disappointed by the way they performed the old material. Not a great evening, and it left me very dubious about the future of Yes. Six months later, when I saw their lousy performance on TV at the Atlantic Records 40th anniversary show, it just confirmed my feeling that they were in a bad phase of their career. I was not surprised at all when Jon Anderson left the band the following spring.